Description This vase was produced at the Yugyokuen ceramic workshop in Tokyo's Shinjuku neighborhood. Kato was the son of a potter from Seto, one of Japan's famous historical centers of pottery production. 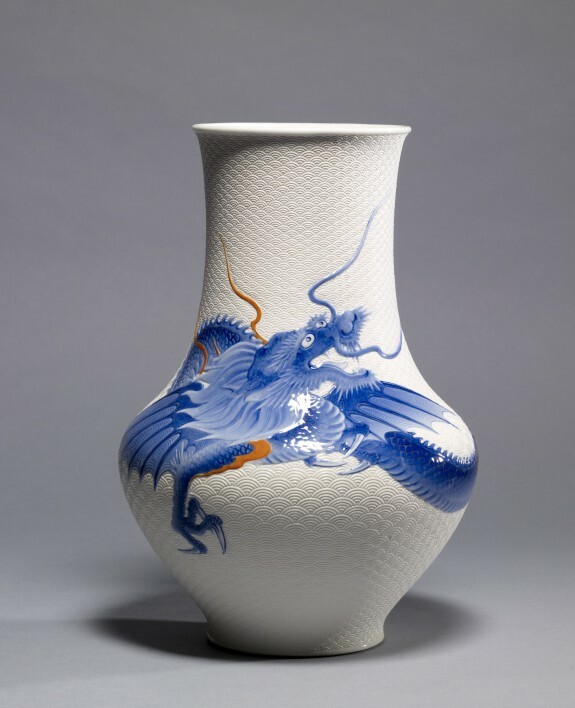 He moved from Seto to Tokyo in 1874 and sought work in one of the modern ceramic factories, the Edogawa Ceramic Plant, which had been established as a center for the development of the arts following Japan's participation in the Vienna International Exposition of 1873. Kato quickly became one of the leading modern porcelain artists in the Tokyo area, competing with other artists at national and international art competitions and fairs. The red-orange overglaze was examined using a Geiger counter and found not to contain uranium. Hirado Porcelain. The Walters Art Gallery, Baltimore. 1980-1981. Master Potters of Japan. The Walters Art Gallery, Baltimore. 1984. JapanAmerica: Points of Contact, 1876-1970. Herbert F. Johnson, Ithaca; Crocker Art Museum, Sacramento. 2016-2017. Provenance The Panama-Pacific International Exposition [no. 115], San Francisco, 1915; Henry Walters, Baltimore, 1915, by purchase; Walters Art Museum, 1931, by bequest.